We all dream of waking up on a sunshiney, springtime Sunday morning to the smell of coffee and breakfast baking in the oven. But, very few of us ever seem to have that sort of experience. Rather, we find ourselves jarred from sleep (far too early) by the alarm clock, our hungry (and impatient) children, or our demanding pets. We stumble out of bed, bleary-eyed and disgruntled, fumble for our glasses and head down the stairs to hit the morning grindstone. Trust me. I understand. Our lives have been an absolute blur lately. Seems we get up each day, head off to work, and barely have time to eat dinner together. Weeknights are spent conducting interviews for freelance projects, writing up articles, or attending events. And we've been getting up at the crack of dawn on weekends to capture as many daylight hours as we can in the kitchen, experimenting with new recipes and taking pictures of our creations. Sometimes it seems as though we never have time for a leisurely breakfast. But, it pays to remember that mornings don't have to be all work and no play. In fact, a little bit of advance preparation goes a long way when it comes to breakfast -- which means you can have your lazy Sunday brunch and eat it too. 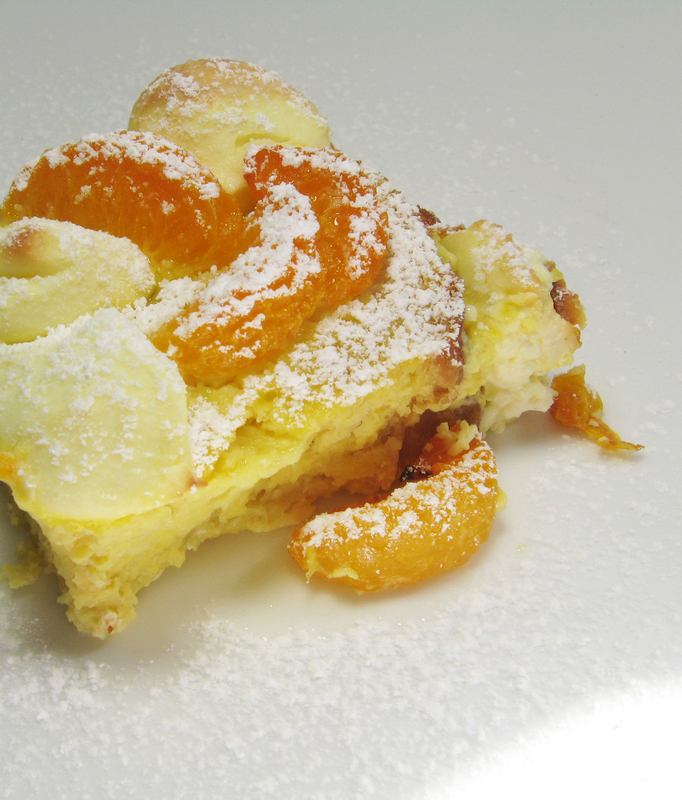 This particular dish makes use of canned (or fresh) mandarin oranges -- a sweet treat that's available all year round, but is especially cheerful during the dark winter months or during the dreary, rainy weekend days of spring. Add a bit of cream cheese and some vanilla spiked custard, leave in the fridge overnight, and you're well on your way to a delicious breakfast with very little effort. Whether you want something you can quickly and easily pop into the oven for your family on a lazy Saturday morning, or a delicious springtime dish to serve to company, this delicious take on baked French toast is sure to brighten even the dreariest of mornings. "Burp!" has been included in this weeks Sites To See. I hope this helps to attract many new visitors to here.